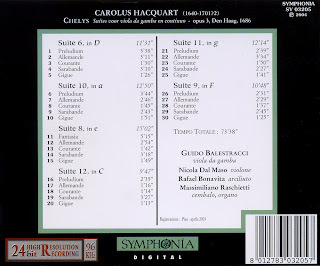 Fauteuil d'Oreille: Carolus Hacquart (1640-1701?2) - Chelys (Suites voor viola da gamba & continuo) - Guido Balestracci e.a. 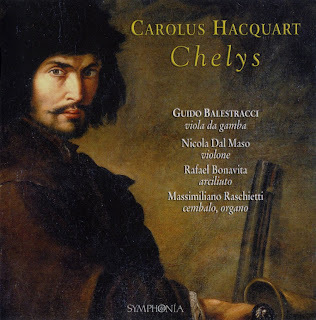 Carolus Hacquart (1640-1701?2) - Chelys (Suites voor viola da gamba & continuo) - Guido Balestracci e.a. "Carolus (Carel) Hacquart is the most important composer of the Low Countries of the 17th century. He was born ca. 1640 in Bruges and received his education, comprising Latin and composition as well as viola da gamba, lute and organ, most probably in his native town. Attracted by the growth of musical life of the rich citizens of the United Provinces, he moved with his brother Philip to Amsterdam in the early 1670's where both gained a living as free-lance musicians, giving lessons to members of the local bourgeoisie. The twelve suites by Hacquart constitute an impressive synthesis of the many tendencies of viol composition in the second half of the 17th century. Differing from his Dutch contemporaries who preferred a rather loose sequence of dances, he adopted the classical French arrangement with the four standard dance movements, preceded by a free prelude or fantasy. The sarabandes have ornamented repeats as practiced by French composers of keyboard music, but the typical French agréments are absent. Instead, Hacquart preferred the highly developed diminution art of Dutch and English musicians." Thanks for this. Merry Christmas! Neste Natal, época em que inevitavelmente sentimos com maior integralidade os preceitos da consciência Crística batendo às portas de nossos corações, o piano clássico (www.pianoclassico.org) deseja aos amigos e parceiros tudo de bom que possamos desejar doar à humanidade, revertendo-se, tudo integralmente, em graças espirituais para nós e para toda nossa família. Que este sentimento fraterno se estenda para toda comunidade planetária agora e para sempre. Thanks a lot for your work in you beautifull and refined blog, that amused me so many times in 2009! I love the pieces you choose and hope that your Chistmas and New Year be peacefull and happy! You make music more accessible to many of us! Merci bien de votre travail sur votre blog, si beau et rafiné, qui m'a amusé plusieurs fois pendant 2009! J'aime les pièces que vous avez choisi et fais mes meilleurs voeux pour votre Noël et 2010! Vous rendez la musique plus accessible pour beaucoup parmi nous! Thanks for this and...Merry Christmas! Dear friend, have a very happy year! Danke schön. Eine nette Musik! Thank you very much for your beautiful blog and music!